In one grand effort, this is an anatomy of power, a history of the ways in which it has been defined, and a study of its forms (force, manipulation, authority, and persuasion), its bases (individual and collective resources, political mobilization), and its uses. 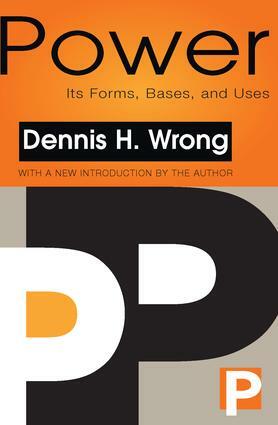 The issues that Dennis Wrong addresses range from the philosophical and ethical to the psychological and political. Much of the work is punctuated with careful examples from history. While the author illuminates his discussion with references to Weber, Marx, Freud, Plato, Dostoevsky, Orwell, Hobbes, Arendt, and Machiavelli, he keeps his arguments grounded in contemporary practical issues, such as class conflicts, multi-party politics, and parent-child relationships. In his new introduction, prepared for the 1995 edition of Power, the author reconsiders the concept of power, now locating it in the broader traditions of the social sciences rather than as a series of actions and actors within the sociological tradition. As a result. Wrong emphasizes such major distinctions as "power over" and "power to," and various conflations of power as commonly used. The new opening provides the reader with a deeper appreciation of the non-reductionist character of the book as a whole. The Bases of Power: Who Gets Mobilized?